The countdown clock to WOW 2012 reads T-minus 7 months and counting. Launch into fall with our end-of-summer sale and lock down tickets to the grand event at early bird savings before this deal expires on Sept 30, 2011. 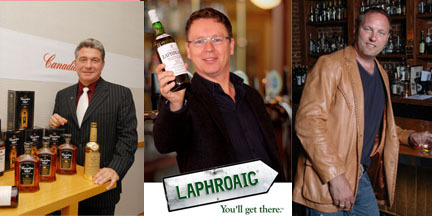 Diageo presents a complete tour of Scotland with their quintessential Classic Malts. The Classic Malts lineup consists of many of the highest awarded malts from the International Wine and Spirit Competition (IWSC) and San Francisco Spirits Competition (SFSC). Dalwhinnie, Talisker, Cragganmore, Oban, Lagavulin and Glenkinchie represent a full range of whisky flavor profiles. The Bushmills Pipe and Drum Band grace us with the sounds of Ireland and of course Bushmills Irish Whiskey graces our palates. North America distilleries Crown Royal, Bulleit and George Dickle each bring their fine beverages for your sampling pleasure. Look out for the new Oban Experience booth for WoW 2012! High West will be releasing its newest Silver Whiskey this October - OMG Pure Rye. Read the fascinating history of American Rye and High West's quest for bringing back this true American product. Douglas Laing is here to stay! After their success at WoW 2011 and establishing contacts and distribution across the Golden State, their excellent whisky easily guaranteed itself shelf space in California’s finest beverage emporiums. We anticipate several new and exciting expressions from Douglas Liang. Part of the Art of Whisky is pairing with foods. Checkout the classic malts Malt-Matcher food pairing section and start preparing for your own Labor Day weekend pairings. Don't wait any longer. These will be the lowest prices and tickets are refundable until Dec 31. TICKETS ARE ON SUMMER DISCOUNT until Sept 30th. Don’t miss this opportunity to indulge in a full range of the “water of life” with excellent company and delectable food. $58.50 (sale Price until 8/31) ALL INCLUSIVE! Vegetarian Selection is available when requested in advance. Let us know if you will be staying for our whisky and cigar after party. (Whisky and Cigar feature not included in the price of dinner). We look forward to sharing a Dram with you! Tickets Must be Purchased in advance. Must be over 21 to attend. Copyright (C) 2011 Whiskies Of The World Expo All rights reserved.